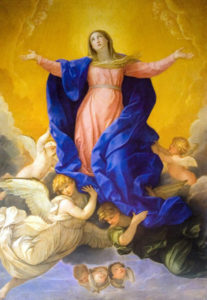 DAY 14 (September 21) THE ASSUMPTION OF THE BLESSED VIRGIN MARY – Welcome to Fr. JohnBosco's Blog! Almighty ever-living God, who assumed the Immaculate Virgin Mary, the Mother of your Son, body and soul into heavenly glory, grant we pray, that always attentive to the things that are above, we may merit to be sharers of her glory. Through our Lord Jesus Christ, your Son, who lives and reigns with you in the unity of the Holy Spirit, one God, for ever and ever. Amen. In the Assumption of the Blessed Virgin Mary, we celebrate the perfection of God’s triumph. The above reading, Revelation 11:19, 12:1-10, describes this triumph of God over evil. So we are not celebrating just Mary, but God who raised her from lowly status to a very respectable position as the Mother of God. With the Assumption, we say that after the death of Mary, her body knew no corruption and that she was carried body and soul into heaven. I can imagine someone asking, “how is that possible?” And I answer, “With God all things are possible” (Luke 1:37). By the way, our bodies knew corruption because of sin. But the doctrine of the Immaculate Conception teaches that Mary was preserved by God from original sin and remained sinless. If she was without sin, how can her body know corruption? All these were possible because Mary had a relationship with Jesus, who is God. If we are in Christ too, we shall equally be exalted like Mary and become sharers of God’s glory. May God give us the grace to remain fervently in him. Amen. O God, who, looking at the lowliness of the Blessed Virgin Mary, raised her to this grace, that your Only Begotten Son was born of her according to the flesh and that she was crowned this day with surpassing glory, grant through her prayers, that, saved by the mystery of your redemption, we may merit to be exalted by you on high. Through our Lord Jesus Christ, your Son, who lives and reigns with you, in the unity of the Holy Spirit, one God, for ever and ever. Amen.